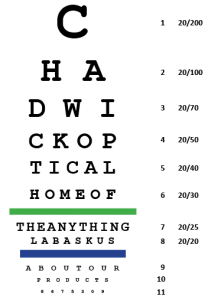 Chadwick Optical, Inc. How Normal Vision Works - Chadwick Optical, Inc.
Before you begin, this is not intended to be an exhaustive science lesson on vision. There are complex intricacies to vision that we have not acknowledged. If you’re looking for details of those intricacies, there are many sources available. We are here to go over with brevity the basic functions of vision, with the goal of helping the reader better understand low vision and the difficulties low vision patients face. Most people have seen this chart, or something similar to it. It’s called a Snellen chart. 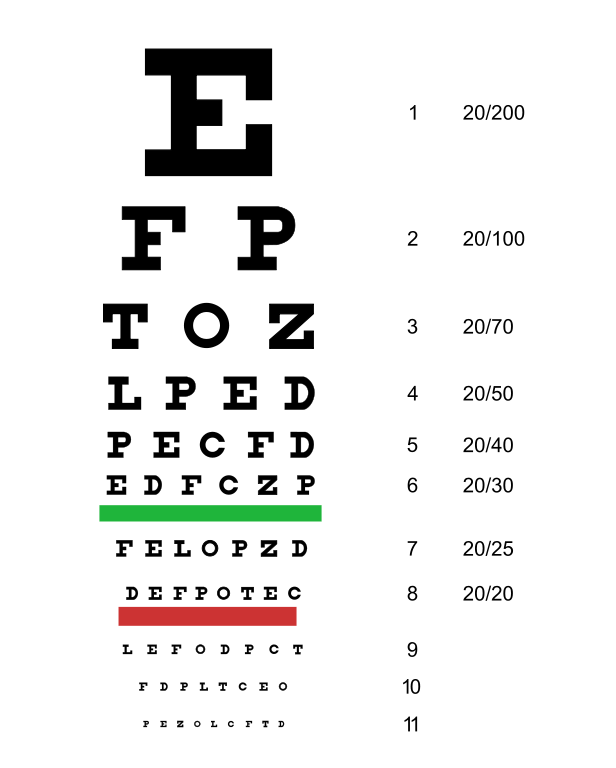 A Snellen chart is a simple measure of visual acuity. The numbers to the right of the chart (20/200, etc) are the visual acuities of a person who can read that particular line from 20 feet away. A person with perfect vision can see the 20/20 line from 20 feet away. A person with 20/100 vision can see the 20/100 line from 20 feet away. A person with 20/20 vision can see the 20/100 line from 100 feet away. Many people require correction with eyeglasses or contact lenses to achieve 20/20 visual acuity. This is called your best-corrected visual acuity. Often times, visual acuities are measured in metric (6/6 = 20/20) or at a shorter distance than 20 feet (10/10 = 20/20). Simulations of normal vision are often depicted with a clear picture. Your vision is much more dynamic than a picture. Have you ever noticed that when you look at something close up, everything around it is blurry? See the picture below of the ancient building. A picture highlights all details of the building simultaneously. An eye does not do that. An eye rapidly scans the picture and assembles a complete picture in your brain. Notice that the blurry pictures have a high-definition focal point. This is a more accurate representation of how vision works. Your vision has high definition in central vision, and blurriness in peripheral vision. Your central, or foveal vision is where you can achieve maximum visual acuity. This area of maximum acuity occupies about 2-3 degrees of your entire visual field. This central vision occurs in a part of the eye known as the fovea. Peripheral vision is everything outside of your central vision, and normally covers about 180 degrees of field. The acuity of peripheral vision gets substantially worse as you get further from the central vision. 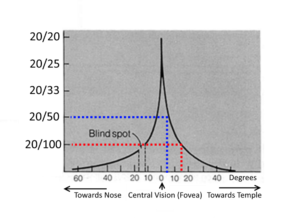 Assuming a patient has perfect vision, this chart shows the rapid degradation of acuity from the central foveal vision to the periphery. While peripheral vision is very poor in acuity, it is extremely useful in helping us detect our surroundings. It alerts us so we can focus our attention. A bug scurrying across the floor or an object flying towards you will alert you, and you can then focus your central vision on it. 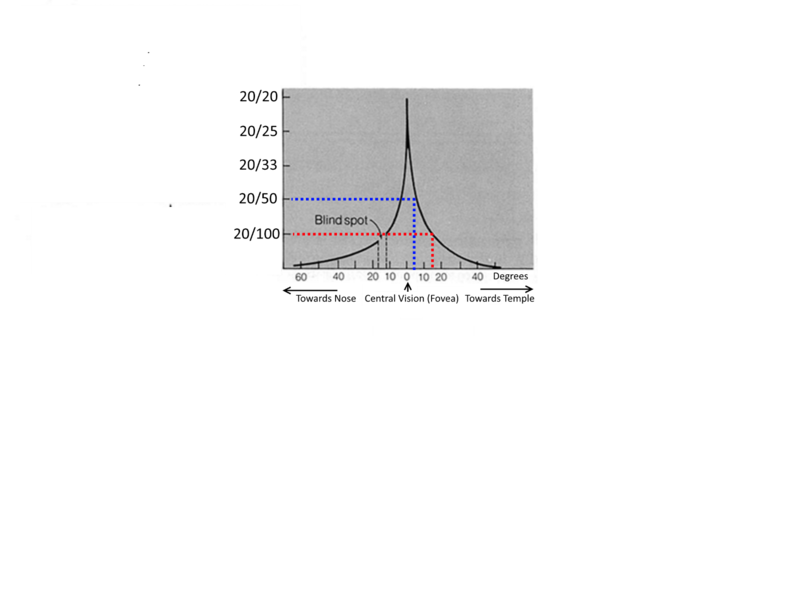 The “blind spot” in the chart above is called the physiological blind spot, and it’s a blind spot that every human has. Did you know you had one? You can’t even notice it under normal circumstances, because your brain fills in the blind area. And did you know you always have double vision? Look at graphic below of the cross and the circle. Sit at your computer with your nose pointing in between the cross and the black circle. At somewhere around 10-14 inches from the computer screen (less if you’re on a mobile device) – the black circle will disappear and the area where the black circle was…will now be all white – this is your BLIND SPOT. You have double vision all the time, and it doesn’t bother you one bit. Double vision is only bothersome when it affects the area where you are focusing. Here are a couple of examples to show you this. Focus on something across the room. Now put your finger about 6 inches in front of your nose while still focusing across the room. How many fingers do you see? If you have normal vision, you should see two fingers. But it’s not particularly annoying, because you’re not focusing on them. Now change your focus to your finger so you only see one finger. Bring the finger closer and closer to your face until you are right up in front of your nose. While you are trying to focus on the finger and see only one finger, you will eventually experience a discomfort, and your eyes will eventually fail to see one finger. You will see two fingers. This is called diplopia – a disturbing double vision where you are focusing. Double vision is around you all the time. Diplopia is undesirable. Most people, with the aid of glasses or contact lenses, can achieve a visual acuity of 20/20. A person is considered to have low vision if their best-corrected visual acuity is 20/70 or less. If their best-corrected vision is 20/200 or less, they’re considered legally blind. As you can see from this image, humans have roughly 180 degrees of total visual field. 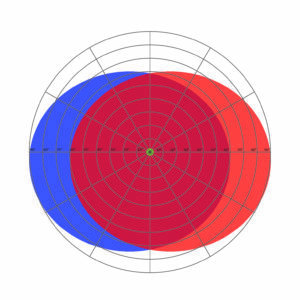 Each individual eye has about 150 degrees, and the two eyes have an overlap of about 120 degrees. This overlap is called binocular vision. Binocular vision gives us precise depth perception, which helps in everything from walking to catching a ball. A patient is considered low vision if they have 20 degrees of field or less in their better seeing eye.